It starts with the first welcoming drink and warm hand towel handed to you upon arrival and it ends with… well, actually it never ends. Luxury travel in and around Etosha will leave a lasting mark. Discovering a world-renowned national park in ultimate luxury is as simple as booking your stay at one or more of the lodges tried and tested by Travel News Namibia. For an entire week, TNN’s content creator, Annelien Robberts had only one obligation – to relish every changing hue of the sunset, savour delicious foods devotedly prepared by professional chefs, snap away at playful lion cubs and to keep quiet when tracking rhino on foot. Onguma is a private reserve situated just outside Etosha’s eastern border. The name stems from the local Herero language and aptly means ‘the place you never want to leave’. It truly lives up to its reputation. After a traditional hand wash with water poured from a silverware jug, followed by the ring of a gong, we enter through the impressive antique wooden doors of the Moroccan-inspired fort. On the other side, the view of Fisher’s Pan immediately draws us into another world that we will become part of for two days. Inside the inner court is a pool we need to cross with three stepping stones jutting out. The pool is decorated with lanterns and bonfires. When we pass those we are led to the lively waterhole where vultures, zebras, impalas, blue wildebeest, warthogs and Damara hornbills abound. A climb up to the top of the fort’s tower leaves us with more breath-taking views. The eye candy continues when we arrive at our own private Bush Suite, a replica of the main fort. Just like the main building, the interior boasts splashes of bright colours and nothing feels out of place. Each mini-suite is completely private with only the sounds of animals making their way to the waterhole. From the large wooden deck, with sun loungers and an outside shower, the views of the sprawling savannah are uninterrupted. Yet another place that we did not want to leave! Onguma Tented Camp is situated on the same reserve as Onguma The Fort and is the epitome of safari chic. With only seven tents in the camp, privacy is the order of the day. The tents have electricity and are equipped with a few extras like hairdryers and mosquito nets. We hardly notice that we are actually staying in tents. A herd of impalas at the waterhole forms our welcoming committee. The lodge’s interior is a combination of earthy textures and natural tones of grey, charcoal, black, white and cream. A touch of bright green adds a modern feel to it. The surrounding nature lends itself to a long lazy afternoon spent on the sofas in the lounge, watching the animals go about their daily routine. When the day heats up, we stroll to the rim-flow pool where we settle down with an ice-cold drink in hand. Two makalani palm trees, characteristic of the north, adorn the waterhole that can be seen from all corners of the camp. Being me, I feel like I need some exercise, so I move back to my patio and grab a good book that I have been meaning to read for weeks. Daily exercise. Tick. Then quickly freshening up in the outside shower and off for dinner. While we dine in elegance, zebras, warthogs and a variety of birds arrive for their aperitif at the waterhole only 60 metres away. After dinner, we move even closer to the waterhole to sit at the campfire, sip on a nightcap and share stories with other travellers. And, as it happens, all the other travellers are American and it is the 4th of July, so we toast their Independence Day together. It was a good day, and it becomes even better when three honey badgers make their appearance right at the campfire – a rare and exciting encounter. With all the under-canvas romance that makes me fall in love with Namibia all over again, I did not even notice that there is free Wi-Fi in the main area. A day without technology is a day well lived. We sleep with our “door” open to make sure we do not miss out on any waterhole action. Charming Villa Mushara is situated only 8 km from the Von Lindequist Gate on the eastern boundary of Etosha National Park. The two villas at Mushara Lodge have recently undergone renovations to make them even more fabulous. We get to experience the harsh wilderness of Etosha combined with the exquisite accommodation and cuisine of Villa Mushara. This stark contrast is mirrored in the interior design of the villas through the use of opposing textures. A sophisticated selection of music ranging from Mozart to Santana sets the mood when we step into our villa – a holiday home of 140 square metres located in the middle of the bush. The in-room library attracts me like a moth is drawn to light. Book in one hand and a drink in the other I cuddle up on the comfortable sofa next to the fireplace. Before dinner, a soak in the bathtub is the order of the day, with candles setting the atmosphere and another drink from the minibar. We come to the conclusion that we cannot leave the fireplace unattended (the best excuse we could come up with), so our dinner is served at the villa. The following day we visit Etosha on a private game drive – a treat for any wildlife photographer! Or anyone who would like to try their hand at photography or simply for anybody who wants to learn about Namibia’s diverse wildlife. When we return to the villa we are spoilt for choice – should we unwind in the lodge’s swimming pool or in our private plunge pool? From the plunge pool, we enjoy the exclusive view of a little waterhole with the pleasure of knowing that impalas and warthogs, amongst other wildlife, come to quench their thirst in our backyard. The outside shower is great to quickly wash off before lounging on the deck and doing some yoga stretches, simply because I feel like I need to make use of all the space. We opt for Little Ongava, located directly outside of Anderson Gate, to explore the south-western part of Etosha. Accommodating a maximum of six guests, Little Ongava embodies the ultimate bush seclusion. The lodge is perched on the crest of a hill with magnificent vistas of the plains stretching as far as the eye can see. We settle in at one of the three spacious suites, with our own plunge pool, a “sala” and an outdoor shower. Standing on the balcony overlooking the well-frequented waterhole below the camp with no other buildings in sight, I feel utterly surrounded by nature. This is luxury. Wooden walkways connect the suites with the lounge and dining area. And along the way, we stop at all the trees with small metal plates to learn both the scientific and the common names. With knowledgeable guides within reach we hardly need the Wi-Fi. After teatime and a good old chat with the friendly staff we leave on our afternoon game drive to explore the reserve. After just a few minutes our guide has thrilling news for us: there is a pride of lions about a 15 minutes’ drive away. That is nothing compared to the distances people travel to catch a glimpse of these majestic creatures in their natural habitat. Although the wildlife is… well, wild, our guide goes the extra mile to ensure that we tick off our desired animal sightings. We hear “white rhino” over the radio and a few minutes later we are treated with the sighting of a mother with her 3-week old calf. If the guide deems the situation safe for both rhinos and guests, a rhino approach is possible – an exhilarating encounter! On the open deck of our room we dine in style under the glittering African night sky. While we are enjoying our aperitif, elephants decide to join us at the waterhole down below. After dinner, we continue our usual exercise. We light up the fireplace, enjoy a nightcap and reflect on our eventful day. And the pampering continues – a hot water bottle keeps my bed warm while I am brushing my teeth. 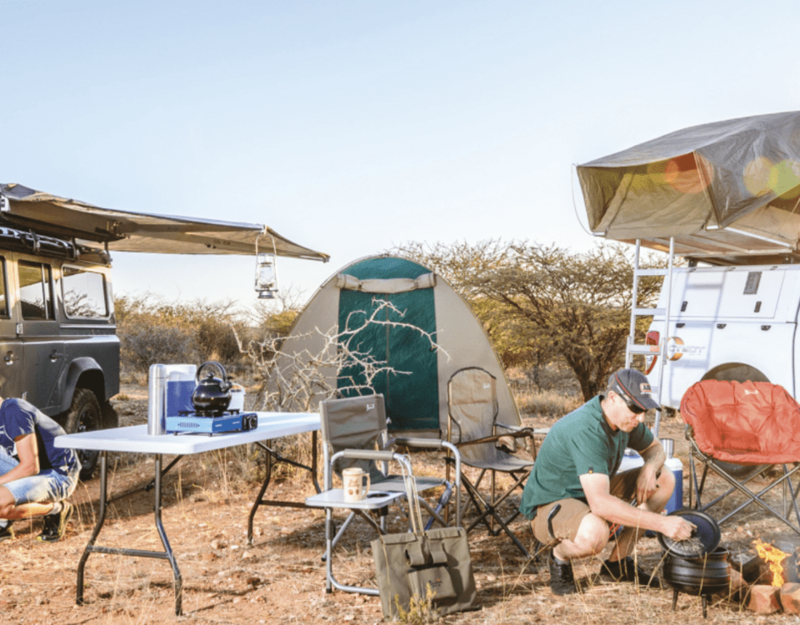 Dolomite Camp is one of a handful of camps inside Etosha’s borders, which makes it all the more exclusive. It is located 45 km from Galton Gate in the western part of the park, an area that was restricted for many years. Not to be missed, watching from the dolomite hill, are the sunset as well as the sunrise. Can one ever have enough hands or camera lenses to capture every changing second of it? A driver fetches us with our luggage at the foot of the dolomite hill and takes us all the way up to our luxury tent at the top from where we admire the endless plains of Etosha. From our private balcony we feel as if we are in the wildlife hotspot of the park. Rhinos and elephants casually stroll by. Springbok gracefully leap about, and dazzle after dazzle of zebras comes to drink at the nearby waterhole. I find my happy place at the rim-flow pool, my recommended spot for the most beautiful sunset pictures. I refuse to leave until all the colours dissipate and the landscape completely fades into darkness. This is when the lanterns are lit and the campfire across from the bar is stoked – the ideal post-sunset spot for enjoying a glass of red wine. How do you know you had another excellent day in Africa when you are lying in your warm bed with a hot water bottle for added comfort? The trumpeting of elephants lulls you to sleep. Safarihoek Lodge offers eight luxury chalets on Etosha Heights, a 60 000 hectare private reserve sharing 70 km of the boundary with Etosha. In the morning, while sipping our coffee on a hill near the lodge, the staff surprises us with an indulgent breakfast. And as Mother Nature has surprises of her own, we hear the loud roar of lions nearby. My morning coffee will never taste the same again. In the late afternoon we walk down to the waterhole where we brush shoulders with the abundant wildlife. When the sky turns indigo and my memory card has run out of space, our guide takes us back to the lodge in a safari vehicle. Upon arrival, we receive pink and orange drinks reminiscent of an African sunset, which in turn reminds me of another day well spent. But luckily it is not over yet. The swimming pool area turns into a romantic candle-lit corner with the campfire right on site providing the necessary heat against the chilly evening air. After indulging in a delicious dinner, we enjoy the campfire with other guests. Some of the staff members join us, not in uniform but in their traditional wear. They share interesting tales with us, giving depth to hearsay stories about everything, from Namibian cultures to life experiences and the wildlife on the reserve. They also share with us that the airstrip for fy-in tourists was only recently built and its inauguration gave cause for great celebrations. Amongst all the pampering and luxury one thing ultimately stands out for me: Wilderness is not a luxury but a necessity for the human spirit. My hope is that we never take it for granted and that we will continue doing everything in our power to preserve it. This is also why each lodge is engaged to serve a bigger purpose so that our country, its people and its wildlife, will prosper. This purpose might include conservation or community, or a combination of the two. Luxury pays necessities. Therefore every guest becomes part of the bigger picture of Namibia and its welfare. It is the best money you will ever spend while simultaneously investing in your own wellbeing.